Camping for the 3 days is for FREE with a standard Bazique ticket and you will park your car in the car park and walk into the festival with your all your camping gear. It’s a beautiful campsite, but don’t forget to bring shade for your tent, if you want it! There are a few upgrades that you can add to your experience. This year, we have moved the entire Glamping Area up onto the grass cricket pitch to make it more comfortable and it will also feature a shaded seating area with a Breakfast Bar serving wraps, gourmet coffee and Bloody Mary’s, so you can greet the day in style. Posh trailer toilets and showers complete your luxury camping experience. The Glamping area has parking conveniently situated and there will be porters to help you with your bags. The main camping area is set beside the main beach, on the huge swimming lake with mountain views. It’s a stunner. Bring shade if you want it, and please remember to only use biodegradable sunscreen to protect the lake. This beautiful campsite is totally free with your 3 day festival pass! No vehicles are allowed in this area. If you would like to camp next to your car, this pass is for you! It’s close to the action and the Lake! One Car Pass allows two camping tents per car and four people per car. These passes are super limited, so crack on and buy one if you want to camp with your vehicle. This pass allows you to bring a live-in vehicle. You are allowed to park in the arena and close to the lake. These basic but good- quality dome tents with 2 single basic foam mattresses are situated in General Camping. No hassle setting up or breaking down, it is enough space for two people, two rucksacks and a whole lotta fun. You have access to the standard festival toilets and shower block. Bring you own bedding. READY SET CAMP: R650 per tent – max 2 people. This year, we have moved the entire Glamping Area up onto the grass cricket pitch to make it more comfortable. The Glamping Area will also feature a shaded dining and bar seating area, with a Breakfast Bar serving wraps, gourmet coffee and Bloody Mary’s, so you can greet the day in style. Posh trailer toilets and showers complete your luxury camping experience. Large dome tents with high quality foam mattresses, sheets, pillows and bedding. If you are after more space, a tent you can stand up in, high lighting and access to posh trailer toilets and showers, then this is the space for you. LARGE DOME TENT: R2900 per tent – max 2 people. For those that like a daytime doze… The tents are the same as the Large Dome tents above, with a stretch tent for shade. 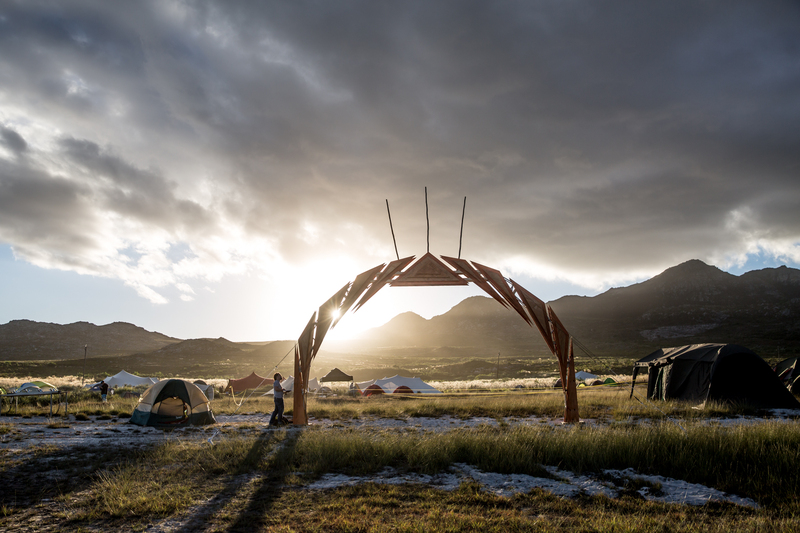 SHADED DOME TENTS: R3900 per tent – max 2 people. Our standard 4m diameter bell tent with a King mattress, sheets, pillows and bedding, lighting and access to posh trailer toilets and showers. Bed can be split into 2 singles, if required. Standard 4m BELL TENT: R4950 per tent – max 2 people. Our standard 4m diameter bell tent with a King mattress, sheets, pillows and bedding, lighting and access to posh trailer toilets and showers. Bed can be split into 2 singles, if required. Shaded under stretch tent for those who like a day time doze. Standard 4m BELL TENT: R5950 per tent – max 2 people.